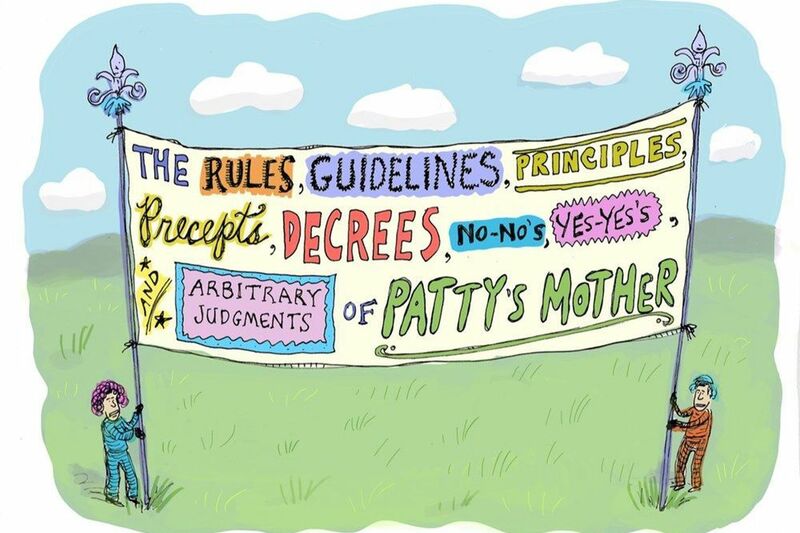 New Yorker humor writer and Abington native Patricia Marx has yet to show her mother the book she wrote about the rules used to raise her. And who can blame her, considering that the book’s title is Why Don’t You Write My Eulogy Now So I Can Correct It? A Mother’s Suggestions (Celadon Books, $20, on sale Tuesday, April 2). Janice Marx is now 92 and living at The Philadelphian condominium on the Parkway. Her daughter will be back in the area on Thursday, April 11, with New Yorker cartoonist and book illustrator Roz Chast to defend the book before her mother and introduce it to the rest of Philadelphia’s reading public. I reached her on her Manhattan apartment’s landline last week. Tell me about your local roots. For many years, before Staples, my parents ran Marx Office Supplies at 10th and Filbert, which was almost as good as a candy shop for a future writer. Our house was stocked with all the Magic Markers, hole punches, gold stars, and paper and pencils you could ever want. I remember Philly as being quite dingy and gritty, and I loved that. This was before [Mayor Richardson] Dilworth fixed it up. I remember going to Bookbinder’s and my mother sending us in to go to Eugene Ormandy's Philadelphia Orchestra children’s concerts — though I think we went to the movies instead because I still don’t know anything about classical music. “You only need to have one child but make sure it’s the right one” is one of your mom’s rules. Are we to take the fact that you’re the eldest of three to mean that you were not, in fact, the right one? Well, I definitely wasn’t perfect. I sulked a lot and my mother used to take my temperature a lot, assuming that if I was that cranky, I must be sick. I also had lots of food issues. No peas, salami, bologna, peanut butter (if with jelly), egg salad, gingersnaps — they might be healthy — water or unflavored milk, among many other things. “Patty has been here the entire weekend and has eaten nothing, what should we do?” was the gist of phone calls my mother would receive on a Sunday from the mother of one of my friends. “Ignore her,” was the answer. She really said that? And that thing about bribery being the premiere child-rearing tool: Did she really say that too? I didn’t have a tape recorder on but yes, she did. She once offered me $100 to cut my bangs. Of course. Wouldn’t you? She also offered me some money to say I loved my brother and sister but I refused on principle. It wasn’t always money, but deals were made. Some things you could get away with but if my mother said, “This is a command performance; you must do this,” you did it. Like that time you talk about in the Introduction when you were at overnight camp and your mother told you to come running as soon as you saw her on Parent’s Weekend so she wouldn’t be the only parent whose kid didn’t seem to miss them. Although funny on paper and perhaps in retrospect, I could imagine these edicts being a little oppressive. Did you ever rebel? Not really. They were said with some irony — she has a great sense of humor — and they actually made sense to me. [Sound of Marx flipping pages of her book] “Humming is hostile.” It says you’re not open for business, I believe that. “Plan every detail of your dinner party in advance” — I do that, too. “Never buy a white car” — because it’s a boring thing to do, right? My mother has a very good ear and eye. I remember once I was talking to her about an idea I had for a humor piece for The New Yorker and she said, “That’s fine, as long as it doesn’t bother you that that’s a very trite idea.” And she was absolutely right. It’s the job of parents to be a little bit annoying. Otherwise kids wouldn’t do anything they're supposed to do. I knew I had a good thing going. When I was a kid, everything was taken care of. I would have stayed a kid if I could have. Is that why you never had kids? At this point, physically, I’m way too old. But mentally, I think I’m still too young. I don’t deal with imperfection very well. I also don’t particularly love responsibility. You’re spending the better part of the next two weeks touring the country talking about motherhood, despite having only been on the receiving end of the experience. Isn’t that a little bit, well, presumptuous? I’m really good at knowing sight unseen whether or not I’ll like a movie, book, or play based on nothing more than hearsay and Google. I’m good at having opinions I’m not entitled to have that are almost always right. Meaning that your opinions about child-rearing are equally uninformed and accurate? If someone asks what childbirth is like I will, of course, defer to Roz [the mother of two]. Otherwise I think my opinions about motherhood are as correct as hers. Tell me more about what you’ll be doing at the Free Library. We have a PowerPoint presentation that has pictures of my parents and her parents [the subject of Chast’s 2014 National Book Critics Circle Award-winning memoir, Can’t We Talk About Something More Pleasant? ], and drawings from the book. Then Roz and I will play a song on our ukuleles. We call ourselves the Ukulear Meltdown. We sing parody songs to public domain tunes like “Park, Park, Park the Car, Somewhere Near the Curb” to “Row, Row, Row Your Boat.” My voice is a little bit funnier than Roz’s — she can actually sing. We’ll be doing a mother’s song. So you haven’t shown your mom the book for fear she will “correct it” down to two pages? Patricia Marx and Roz Chast speak and sing at the Parkway Central Branch of the Free Library of Philadelphia, 1901 Vine St., on Thursday, April 11, at 7:30 p.m. Admission of $28 per person or $43 per couple includes a copy of their new book. Call 215-567-4341 or visit freelibrary.org/authorevents for tickets.